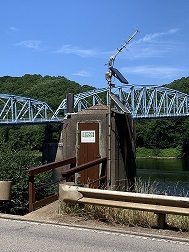 LOCATION.--Lat 41`06'02", long 79`40'53", Armstrong County, Hydrologic Unit 05010006, on right bank 500 ft downstream from bridge on State Highway 368 at Parker, 1.1 mi downstream from Clarion River, and at mile 83.4. PERIOD OF RECORD.--October 1932 to current year. Prior to October 1963, published as "at Parkers Landing." Gage-height records collected at same site since 1885 are contained in reports of U.S. Weather Bureau. GAGE.--Water-stage recorder and non-heated tipping bucket precipitation gage. Datum of gage is 845.14 ft above National Geodetic Vertical Datum of 1929. Prior to Oct. 1, 1932, U.S. Weather Bureau gages at different datums. Oct. 1-28, 1932, non-recording gage at datum 27.00 ft lower. Satellite telemetry at station. REMARKS.--Flow regulated since 1924 by Piney Reservoir, since December 1940 by Tionesta Reservoir (station 03019500), since November 1949 by Chautauqua Lake, since June 1952 by East Branch Clarion River Lake (station 03027000), since October 1965 by Allegheny Reservoir (station 03012520), since July 1970 by Union City Reservoir (station 03021518), and since January 1974 by Woodcock Creek Lake (station 03022550). Supplied by NWS: Action stage-13.9 ft; Flood stage-20 ft; Moderate flood stage-23 ft; Major flood stage-26 ft.